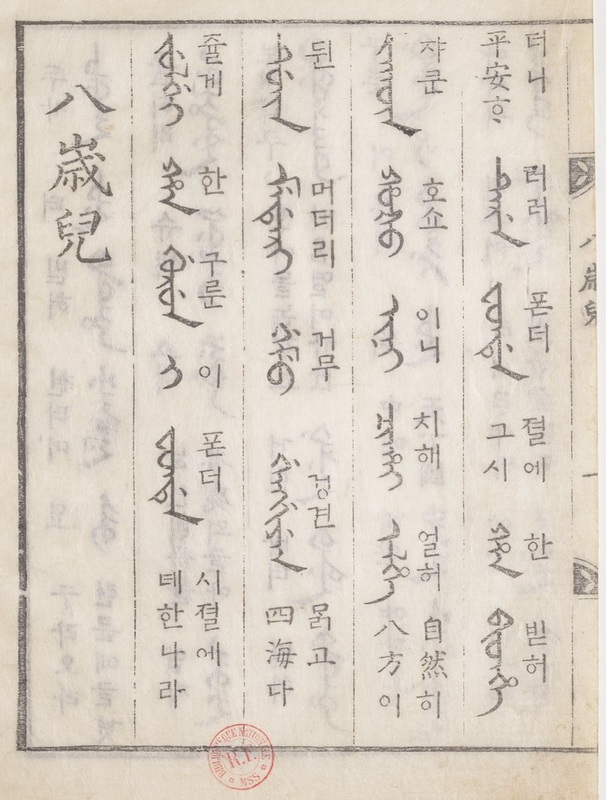 Following from an earlier post on the 八歲兒 (P’alsea/Eight-year-old Child), a Manchu-Korean primer, here is the transcription of the 小兒論 (Soaron/Conversation with a Little Child). Like the P’alsea, this short book is another of the “Four books of Qing Studies”(1) and also features a child prodigy. The difference is that this time the child is only three years old and gets to be tested by Confucius himself. (1) The four books that were used to learn Manchu in Korea. On these, see Choe Y., “Manchu Studies in Korea“, Journal of Cultural Interaction in East Asia, Vol. 3, 2012, p. 89-101. (2) Images of the book can be found on the website of the Kyujanggak Insitute for Korean Studies, together with the 三譯總解/Samyeok Chonghae (selected chapters from the Ilan gurun i bithe/三國志, which, to the best of my knowledge, is not available elsewhere on the internet. The Manchu translation of the Jin Ping Mei, the Gin ping mei bithe, can now be found online here, on the website of the Documentation and Information Center for Chinese Studies, Kyoto University, (see under 滿文金瓶梅 一百回)(1). Despite being a translation, the language of the Manchu Gin Ping Mei has been hailed as the finest of all Manchu literature by no less than Erich Haenisch: “Die Übersetzungssprache, die noch das lebendige Idiom verrät, leicht und flussig, wird von keinem anderen Werk der Mandschuliteratur erreicht” (2). (1) If you use Firefox, the pictures may not appear. Using Internet Explorer should take care of it. (2) Haenisch E., Mandschu-Grammatik, 1961, p. 149. Cf. also Laufer B., ‘Skizze der Mandschu Literatur’, Revue Orientale IX, 1908, p. 32. For a short time this month, the BNF had put online a copy of the P’alsea (八歲兒), a Manchu-Korean primer and one of the “Four books of Qing studies” (1). It seems to have now been removed from their website but here is a transcription of the text. Designed to teach basic Manchu, it features a child prodigy from the Han dynasty who leaves his parents to attend a meeting of 5000 scholars summoned by the emperor. There he answers every question the emperor asks him and is granted a title. (1) About these, see Choe Y., ‘Manchu Studies in Korea‘, p. 91-94. This is maybe old news but I just found that the Muséum National d’Histoire Naturelle has digitalized a complete copy of the Ge ti ciowan lu bithe, Parrenin’s translation of a 18th (end of the 17th) c. European anatomical treaty. The BNF also has a copy of this work available for download but it does not seem to be complete. Readers interested in this text can now read it in its entirety. The two copies seem to sometimes differ in wording as well as in how the content is organized.